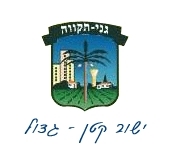 Local Council Ganei Tiqva (meaning Gardens of Hope) is situated in the south Sharon area, just south of Petah Tikva which also gave it its name. Est. 1949, pop. 10,500. The flag at the city hall was white with emblem. Another variant spotted by Mrs. Burstein was blue with emblem. The municipal emblem was published in the official gazette (Rashumot, Yalkut ha-Pirsumim), YP 4424, 4 July 1996. Sources: photograph by Ms. Rachel Burstein; this webpage. Established in 1949 as "Shikun HaYovel". Renamed and become Local Council in 1954.